Este apartamento estudio bellamente presentado y totalmente renovado está situado en el complejo de Parque Santiago 1 y justo frente al mar. El estudio, que cuenta con una de las mejores ubicaciones del complejo, tiene un balcón privado y soleado que da a la piscina y tiene vistas al mar. La piscina se calienta durante los meses de invierno. Hay un cuarto de baño completamente modernizado con bañera, ducha y WC. Separa zona moderna cocina totalmente equipada, sala de estar y balcón. El apartamento está ventilado por ventilador a control remoto. El estudio se puede acceder a través de un ascensor. Hay un bar cafetería / piscina del hotel, restaurante, supermercado, y salón de belleza. Siendo una urbanización privada y segura del complejo tiene sobre la seguridad del sitio y acceso directo desde el complejo en primera línea de mar es a través de puertas aseguradas. Todos los servicios y excelentes restaurantes asequibles se encuentran cerca. El paseo marítimo ofrece un nivel a pie de Los Cristianos y Las Américas centrales. El complejo está situado en una excelente ubicación arriba en el mercado dentro de Las Américas y es adecuado para los más exigentes de turista. Wifi privado gratuito en el apartamento y wifi gratuito en la zona de la piscina. Totalmente modernizado baño con bañera, ducha, lavabo, WC y paredes con azulejos. Secador De Pelo. The studio was just perfect for us. From start to finish the full experience was good. The studio was lovely it had literally everything we could possibly have needed and more. Everything was spotless An bedding was changed and new towels brought in weekly. The view from the balcony, of the swimming pool and the sea, was beautiful. The owner was very helpful and easy to get in touch with We would highly recommend this studio. Thank you so much for your lovely review. I am so glad to hear that you found the booking process and communication with me so easy. Thank you for acknowledging that the apartment was spotless and had everything you needed for your stay. I agree with you about the view of the sea and the pool from the balcony beautiful, it's one of the reasons we bought the apartment. Thank you for booking your next holiday with us so soon. Stayed here for a week (15.02-22.02.19) and everything was perfect!! Instructions beforehand were excellent and we got straight into apartment. Loads of storage space for all our gear. We had plenty of space as only a couple and bathrooom shower was always good and hot! We used the fridge, kettle and toaster odd times which was all we needed. My Mrs loved the sunset sat on the balcony watching the sun go down before getting ready. The location is excellent, everything on your doorstep including a shop,, the sea front, bars and restaurants. Would defo stay here again, thank you. Thank you so much for leaving such a lovely and informative review. We are glad to hear that you found everything to be perfect. Its always good to hear that our correspondence is excellent and that the information we give beforehand is so helpful. We also love to sit on the balcony and watch the sunset. One of the main reasons we purchased the apartment is for its wonderful location to all amenities, so we are happy to hear that you found the location to be excellent too. Would love to hear from you again in the future. We both loved our stay in Parque Santiago 1. The apartment is spotlessly clean and has everything you need for a short or long stay with beautiful pool and sea views. The complex itself has a superb heated pool and pool bar serving great value snacks and drinks. Communication with the owner was first class from Start to finish. Thank you so much for your lovely review. We are so glad that you enjoyed your holiday and your stay in our apartment. Its always lovely to hear from guests how spotlessly clean the apartment is, I will definitely pass this on to the cleaners who work tirelessly to maintain such high standards. Its also lovely to hear how much you enjoyed the complex; the pool area and pool bar. Thank you for advising that the communication with us was first class, we do ensure that we respond to any queries prior to and during your stay to ensure you receive the best service possible. We look forward to hearing from you again in the future. We loved staying in this apartment-the location was wonderful for us and just what we wanted. The owners were very easy to contact and nothing was too much trouble. Will book again! Thank you so much for taking the time to leave us such a lovely review. I am so glad to hear that you thought our apartment and location was fantastic. Its always good to hear that guests find communication with us so good. Will look forward to hearing from you again in the future. 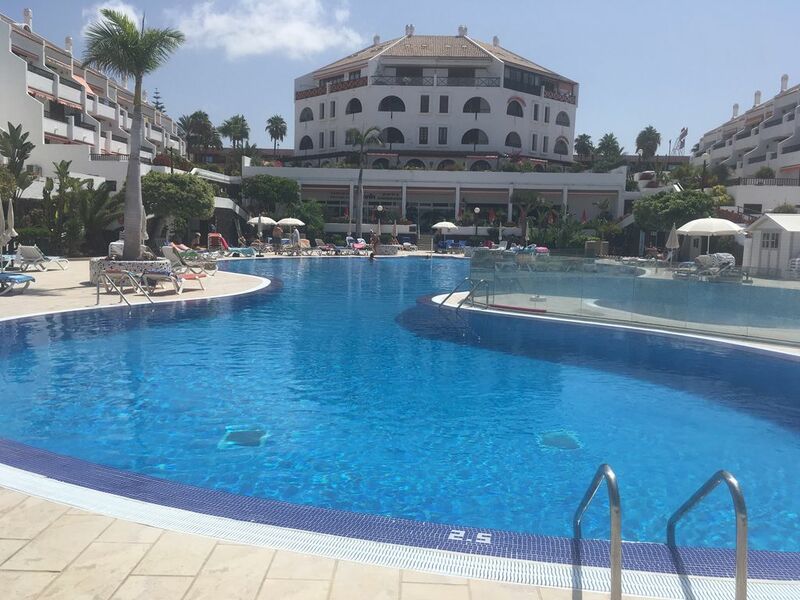 could not have been any better would recommend staying here apartment is ideal we loved it that much we have booked 2 more holidays the lift takes you straight outside your room or going down to the pool and restaurant area thank you Tanya it was perfect for us . Thank you so much for taking the time to leave such a lovely review. I am so glad you enjoyed your holiday. Complejo en primera linea. 100m de la playa (2 minutos a pie). Playas de arena blanca, deportes acuáticos. El paseo marítimo ofrece un nivel a pie de Los Cristianos y Las Américas centrales. El Aeropuerto Reina Sofía (TFS) se encuentra a 15/20 minutos y cuesta alrededor de 25 euros en taxi. Todos los servicios y excelentes restaurantes asequibles se encuentran cerca del complejo. Alquiler de coches y aparcamiento, parada de taxis, médicos, farmacias, bancos y cajeros automáticos, restaurantes, tiendas de diseño y centros comerciales se encuentran muy cerca y el nivel de a pie. Las Américas tiene una variedad de bares y entretenimiento para todos los gustos. El complejo está situado en una excelente ubicación arriba en el mercado dentro de Las Américas y es adecuado para los más exigentes de turista. Siam Park es sólo un paseo / el coche 10 minutos en autobús desde el complejo y es de Tenerife nueva atracción familiar. Es el mayor parque temático con atracciones acuáticas de Europa. Siam Park cuenta con espeluznante paseos combinados con exótica vida marina y fue diseñado con la ayuda de profesor superior de Bangkok Universitys de la arquitectura. Hay una sensación distinta tailandés con mercados flotantes, pabellones y casas de té.